Australia at the Yerevan Chess Olympiad. Type: BOOKS. Detail: Rogers, I. Product Code: 1875716076. Category: UNDER $10. Publisher: ACE. The 1996 Chess Olympiad in Yerevan, Armenia, was exceptionally eventful, both on and off the board. Australia was one of 105 countries who battled through 14 rounds of the Olympiad, while the city around them was thrown into turmoil by a controversial Presidential election followed by a coup d'etat. 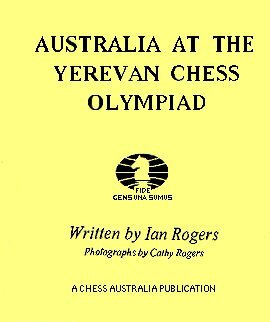 Australia at the Yerevan Chess Olympiad is the story of this major chess event from the point of view of the successful Australian team. All game played by the Australians are included, most with annotations, as well as fine games by players from other Olympiad teams.